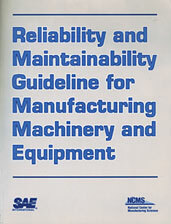 This guideline is intended to provide a description of reliability and maintainability fundamentals for manufacturing machinery and equipment user and supplier personnel at all operating levels. It embraces the concept of up-front engineering and continuous improvement in the design process for machinery and equipment. The revision includes information to help implement and clarify the activities necessary to build and employ more reliable machinery and equipment. The guideline consolidates reliability and maintainability terminology, methodology and procurement language generally accepted by suppliers and users of equipment employed for the manufacture of discrete components. This will help integrate reliability and maintainability concepts when equipment is designed, and contribute to the reduction of maintenance, warranty, and life cycle costs while increasing equipment availability. Section I: Introduction to Reliability & Maintainability and Its Implementation - Introduction to Reliability and Maintainability; and Implementing R&M Through the Life Cycle Process. Section II: Reliability & Maintainability and the Life Cycle Process - User and Supplier R&M Activities in the Concept and Proposal Phase; User and Supplier R&M Activities in the Design and Development Phase; R&M Activities During the Build and Install Phase; R&M Activities During the Operation and Support Phase; and R&M Activities During the Conversion or Decommission Phase. Section III: Supporting Documentation - Life Cycle Phases and Life Cycle Costs; Tailored Reliability & Maintainability Program Matrices; Sample R&M Activity Matrix; R&M Tools and Techniques; R&M Program Planning Worksheet; Data Tracking and Feedback System; Failure Mode and Effects Analysis; R&M Training; and Glossary. Co-published by SAE International and the National Center for Manufacturing Sciences, Inc. If you do not have access to SAE MOBILUS via username/password or institutional access, you can still purchase the Book, Reliability and Maintainability Guideline for Manufacturing Machinery and Equipment.